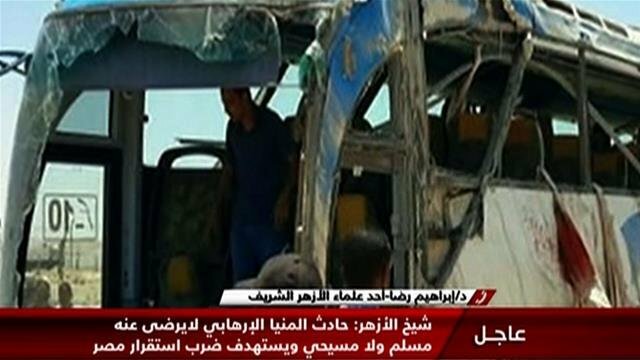 Islamists opened fire on a bus carrying Coptic Christians in Minya, Egypt. The holy Muslim month of Ramadan starts on Saturday. Gunmen opened fire on two buses and a truck carrying Coptic Christians in Minya, Egypt on Friday, killing at least 26, including children. Some 26 people were also injured in the attack. The group of between eight and 10 gunmen, reportedly dressed in military uniforms according to eyewitnesses, approached the convoy in three four-wheel-drive pickup trucks before opening fire, according to local media reports and the Egyptian Interior Ministry. “They used automatic weapons,” Essam el-Bedaiwy, governor of Minya told state television as cited by AFP. Security chiefs established a perimeter around the scene and launched a hunt for the attackers, setting up dozens of roadblocks in the area and sending out patrols to scour the desert road.